in a shady ATM machine or otherwise. 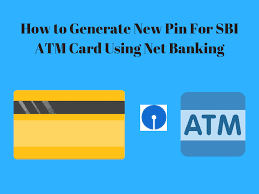 If you as a SBI debit card or ATM card holder have forgotten your PIN and finding it difficult to generate a new one, here’s a simple and easy process. To generate an ATM card PIN, without going to your SBI branch, all one needs is the access to the SBI net banking facility. Step 1: Log on to ‘Onlinesbi’ website. Remember, internet banking services will not be accessible to you if your mobile number is not updated in the bank records. Step 5: You will be shown 2 options to set a new PIN – Either by using OTP or by using Profile password. Choose any one. Step 7: Now, to enter new PIN which will be of 4 digits you will have to enter only first 2 digits. Once submitted, the SBI will send the last 2 digit to you through SMS. This is done to ensure safety. Step 8: Get the last 2 digits from your mobile phone SMS and lastly enter all 4 digits and submit. On successful creation of new ATM PIN, the message will be displayed. If you have a new ATM card, after generating the PIN, use it in any SBI ATM for activation of the card. One should register the mobile number at the ATM or branch to get SMS alerts for all transactions above Rs.5000. This will intimate you of any fraudulent transactions in your account. Once you realise that your card is stolen or misplaced, call the bank to block it immediately. And, once you get a replacement of your card, follow the above steps to generate new PIN. The State Bank of India (SBI) has a huge network of ATMs in the country, and as per the RBI guidelines, an SBI ATM card holder is entitled to 3 free transactions in 6 Metro Centres (Mumbai, Delhi, Chennai, Kolkata, Hyderabad & Bengaluru) and 5 free transactions (Financial and Non-Financial) in a calendar month (for Savings Bank account holders only) at other centres.